Maple is lighter than hickory and allows Zildjian to make a larger diameter stick without the weight of a hickory stick. The Maple Mini Ball model has the diameter, but is a light stick with a small ball for a more controlled sound. The DIP material is a special coating that is applied to the grip area of the stick to provide a comfortable, slightly tacky gripping surface. This allows drummers to loosen their grip and relax their hands. 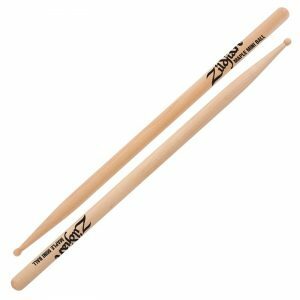 Maple is lighter than hickory and allows Zildjian to make a larger diameter stick without the weight of a hickory stick. The Maple Mini Ball model has the diameter, but is a light stick with a small ball for a more controlled sound.